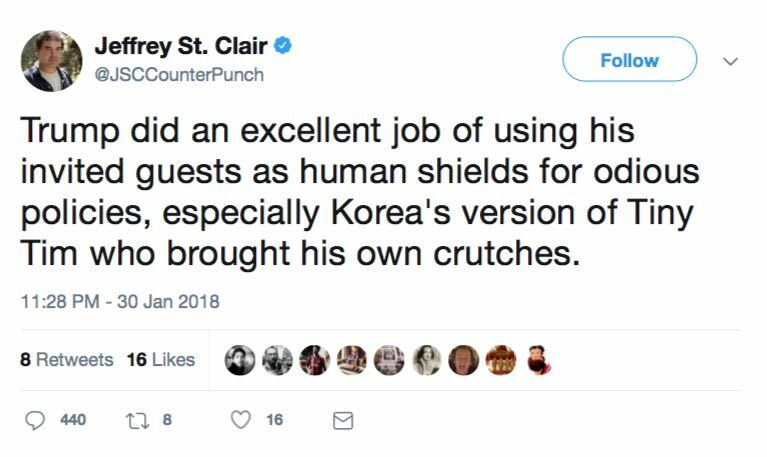 In a breathtaking, unhinged display apparently triggered by President Donald Trump's well-received State of the Union address, Counterpunch Editor Jeffrey St. Clair outrageously mocked invited guest, double amputee, and North Korean defector Ji Seong-ho as "Korea's version of Tiny Tim who brought his own crutches." 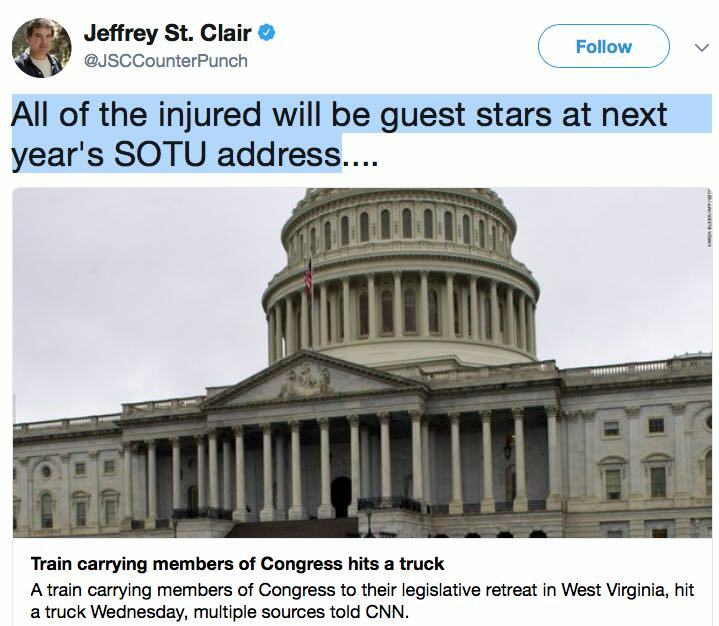 13 hours later, after a train carrying Republican congresspersons and staff crashed, killing a truck driver and seriously injuring several passengers (while non-seriously injuring several congresspersons), St. Clair tweeted that "All of the injured will be guest stars at next year's SOTU address." St. Clair should have known that Seong-ho's father "was caught trying to escape, and was tortured to death," as Trump described the father's manner of death in his Tuesday speech. St. Clair's past associations among "progressive" journalists and opinion leaders should cause one to wonder if he is alone in holding such an inhumane thought, and is only exceptional because he has articulated it. Counterpunch's current editor once worked at the far-left In These Times. "Original sponsors" of that publication include these people described as "noted intellectuals": Daniel Ellsberg, E.P. Thompson, Noam Chomsky, Barbara Ehrenreich, Julian Bond and Herbert Marcuse. St. Clair is included among the publication's notable alumni. Other recognizable alumni include the following: Eric Alterman, Dean Baker, Sidney Blumenthal, David Corn, Ana Marie Cox, Barbara Ehrenreich, Tom Frank, Amy Goodman, Christopher Hayes, Naomi Klein, Robert W. McChesney, Harold Myerson, Andrew Sullivan, Kurt Vonnegut, and Joan Walsh. What kind of despicable fever swamp must In These Times be to graduate the likes of Jeffrey St. Clair to supposedly bigger and better things? ... the young and old worked long hours with few breaks, the pay averaged sixty-seven cents an hour, fieldwork behind equipment spraying pesticides was commonplace and workers expressing dissatisfaction were fired without recourse. Criticizing the Sherrods went against leftist orthodoxy, given Shirley Sherrod's dispute with the late Andrew Breitbart over her treatment of white farmers as a then-Obama administration USDA official. Given that its current editor has gone so far over the edge, it's hard to imagine that much of Counterpunch founder Alexander Cockburn's willingness to expose hypocrisy and corruption on both the left and the right remains. Given Jeffrey St. Clair's tweets, why should anyone even care to find out?